Please no. Please, have mercy. This has been such a gross summer. Please, give us a break. I beg of you. I can't take it anymore. [clears throat] Sorry about that. I'm so tired of the nasty weather pattern that's plagued the eastern United States over the past couple of weeks that I've reached the bargaining stage of the grief process. As you could have guessed, the weather over the East Coast this coming week will closely resemble the intensely muggy, torrentially rainy, and persistently stormy pattern we've seen on and off for the past three weeks. This week will feature a strong Bermuda High over the western Atlantic Ocean and a stubborn trough running up against it from the west. Just about everyone from the Gulf to New England will deal with the fallout from this atmospheric tug-of-war between the ridge to the east and the trough to the west. 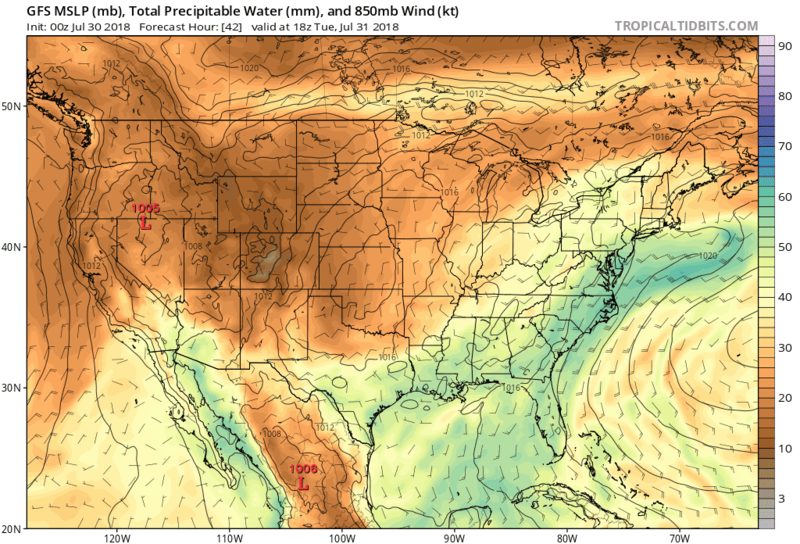 The southerly winds flowing between the ridge/trough combo will open up a conveyor belt of tropical moisture across the East Coast, bringing deep tropical moisture over the region. Precipitable water measures the amount of moisture in the atmosphere, effectively telling us how deep of a reservoir of moisture thunderstorms will have to tap into as they rain themselves out. The greater the precipitable water, the greater than moisture thunderstorms have to work with, and the heavier the rain can be. The Sunday evening run of the GFS (American) weather model shows precipitable water values over the southeast and Mid-Atlantic hovering at or above 2.00", which is very high outside of the tropics. Accordingly, any showers and thunderstorms that develop will have a rich supply of moisture feeding their heavy rains. 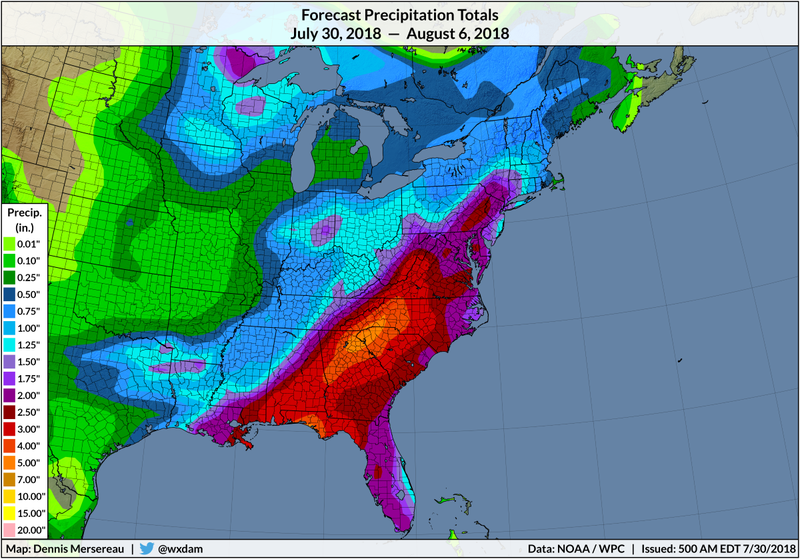 The Weather Prediction Center expects a widespread shot at two or more inches of rain over the next seven days from the Gulf Coast through Pennsylvania, with the greatest totals expected along and to the east of the Appalachians in the southeast. It's not out of the question for some areas to see much higher rainfall totals if they get caught under training thunderstorms. The region certainly doesn't need it. Recent rains have brought extensive flooding to the Mid-Atlantic and brought many of us out of a growing rainfall deficit. More than a foot of rain fell across communities from eastern Maryland through east-central Pennsylvania, leading to widespread flooding. It won't take much more heavy rain to cause more flooding concerns over areas that have already seen plenty of heavy rain in recent days.